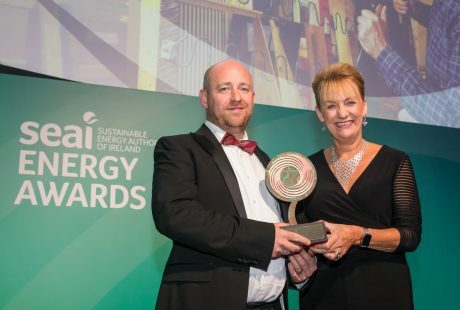 The Rediscovery Centre, the national centre for the circular economy, received national recognition at the annual SEAI Sustainable Energy Awards in the Mansion House on Thursday the 25th of October. The not for profit organisation won the Buildings category for their unique repurposed Boiler House located in the heart of Ballymun. The Rediscovery Centre demonstrates best practice in building design, construction, energy efficiency and operation. The building was designed to ensure minimum energy usage throughout its operational lifetime. The Rediscovery Centre is a thoroughly energy efficient building and it has achieved an A2 BER rating. It boasts many sustainable features including an air source heat pump, composting toilets, rain water harvester, led lighting, solar panels (PV & thermal), green roof and living wall, onsite grey water recycling, landscaping to encourage biodiversity, hempcrete, smart metering, air quality monitoring and an interactive BMS. In 2013, Dublin City Council and the Rediscovery Centre embarked on an ambitious partnership project to completely revamp the council’s former Boiler House in Ballymun and secured funding from the EU’s LIFE + Environment Fund, the Department of Communications, Climate Action and the Environment and the Department of Housing, Planning Community and Local Government and the City Council. In January 2016 they broke ground on the site and it was completed by December 2016. During the refurbishment of the old Boiler House, the project team had an innovative commitment to designing for reuse and recovery. The project reduced the quantity of materials being sent to landfill during the construction process by ‘designing out waste’ and effective site waste management. All waste produced was reused, recycled or recovered as appropriate. Overall wherever possible materials were specifically selected based upon their ability to demonstrate best practice reuse, recycling or recovery.